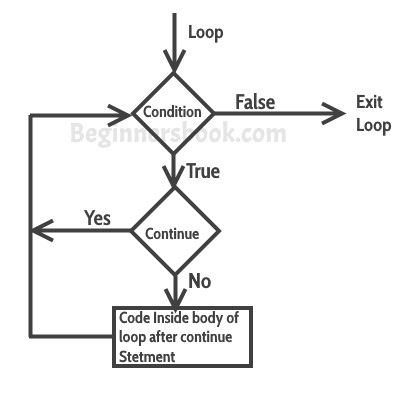 The continue statement is used inside a loop to skip the rest of the statements in the body of loop for the current iteration and jump to the beginning of the loop for next iteration. The break and continue statements are used to alter the flow of loop, break terminates the loop when a condition is met and continue skip the current iteration. Lets say we have a list of numbers and we want to print only the odd numbers out of that list. We can do this by using continue statement. We are skipping the print statement inside loop by using continue statement when the number is even, this way all the even numbers are skipped and the print statement executed for all the odd numbers.